This article is about the town of Dundalk in Ireland. For other uses, see Dundalk (disambiguation). "I gave birth to brave Cú Chulainn"
Dundalk (/dʌnˈdɔːk/, Irish: Dún Dealgan, meaning "Dalgan's fort") is the county town of County Louth, Ireland. It is on the Castletown River, which flows into Dundalk Bay, and is near the border with Northern Ireland, halfway between Dublin and Belfast. It has associations with the mythical warrior hero Cú Chulainn. 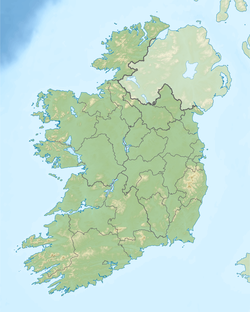 The Dundalk area has been inhabited since at least 3500 BC during the Neolithic period. A tangible reminder of this early presence can still be seen in the form of the Proleek Dolmen, the eroded remains of a megalithic tomb located in the Ballymascanlon area to the north of Dundalk. Celtic culture arrived in Ireland around 500 BC. According to the legendary historical accounts, the group settled in North Louth were known as the Conaille Muirtheimne and took their name from Conaill Carnagh, legendary chief of the Red Branch Knights of Ulster. Their land now forms upper and lower Dundalk. Dundalk had been originally developed as an unwalled Sráid Bhaile (meaning village; translates literally as "Street Townland"). The streets passed along a gravel ridge which runs from the present day Bridge Street in the North, through Church Street to Clanbrassil Street to Earl Street, and finally to Dublin Street. In 1169 the Normans arrived in Ireland and set about conquering large areas. By 1185 a Norman nobleman named Bertram de Verdun erected a manor house at Castletown Mount and subsequently obtained the town's charter in 1189. Another Norman family, the De Courcys, led by John de Courcy, settled in the Seatown area of Dundalk, the "Nova Villa de Dundalke". Both families assisted in the fortification of the town, building walls and other fortification in the style of a Norman fortress. The town of Dundalk was developed as it lay close to an easy bridging point over the Castletown River and as a frontier town, the northern limit of The Pale. In 1236 Bertram's granddaughter, Rohesia commissioned Castle Roche to fortify the region, and to offer protection from the Irish territory of Ulster. The town was sacked in 1315, during the Bruce campaign. After taking possession of the town Edward Bruce proclaimed himself King of Ireland and remained here for nearly a whole year before his army was totally defeated and himself slain after being attacked by John de Birmingham. Dundalk had been under Royalist (Ormondist) control for centuries, until 1647 when it became occupied by The Northern Parliamentary Army of Colonel George Monck. The modern town of Dundalk largely owes its form to Lord Limerick (James Hamilton, later 1st Earl of Clanbrassil) in the 17th century. He commissioned the construction of streets leading to the town centre; his ideas stemming from his visits to Continental Europe. In addition to the demolition of the old walls and castles, he had new roads laid out eastwards of the principal streets. The most important of these new roads connected a newly laid down Market Square, which still survives, with a linen and cambric factory at its eastern end, adjacent to what was once an army cavalry and artillery barracks (now Aiken Barracks). In the 19th century, the town grew in importance and many industries were set up in the local area, including a large distillery. This development was helped considerably by the opening of railways, the expansion of the docks area or 'Quay' and the setting up of a board of commissioners to run the town. The partition of Ireland in May 1921 turned Dundalk into a border town and the Dublin–Belfast main line into an international railway. The Irish Free State opened customs and immigration facilities at Dundalk to check goods and passengers crossing the border by train. The Irish Civil War of 1922–23 saw a number of confrontations in Dundalk. The local Fourth Northern Division of the Irish Republican Army under Frank Aiken, who took over Dundalk barracks after the British left, tried to stay neutral but 300 of them were detained by the National Army in August 1922. However, a raid on Dundalk Gaol freed Aiken and over 100 other anti-treaty prisoners; two weeks later he retook Dundalk barracks and captured its garrison before freeing the remaining republican prisoners there. Aiken did not try to hold the town, however, and before withdrawing he called for a truce in a meeting in the centre of Dundalk. The 49 Infantry Battalion and 58 Infantry Battalion of the National Army were based in Dundalk along with No.8 armoured locomotive and two fully armoured cars of their Railway Protection Corps. For several decades after the end of the Civil War, Dundalk continued to function as a market town, a regional centre, and a centre of administration and manufacturing. Its position close to the border gave it considerable significance during the "Troubles" of Northern Ireland. Many people were sympathetic to the cause of the Provisional Irish Republican Army and Sinn Féin. It was in this period that Dundalk earned the nickname 'El Paso', after the Texan border town of the same name on the border with Mexico. Dundalk is a meeting point between Dublin and Belfast, and has played a central role in the origin and evolution of the peace process. More than most towns in our country, Dundalk, as a border town, has appreciated the need for a lasting and just peace. On 1 September 1973, the 27 Infantry Battalion of the Irish Army was established with its Headquarters in Dundalk barracks, renamed Aiken Barracks in 1986 in honour of Frank Aiken. Dundalk suffered economically when Irish membership of the European Economic Community in the 1970s exposed local manufacturers to foreign competition that they were ill-equipped to cope with. The result was the closure of many local factories, resulting in the highest unemployment rate in Leinster, Ireland's richest province. High unemployment produced serious social problems in the town that were only alleviated by the advent of the Celtic Tiger investment boom at the start of the 21st century. Dundalk's economy has developed rapidly since 2000. Today many international companies have factories in Dundalk, from food processing to high-tech computer components. Harp Lager, a beer produced by Diageo, is brewed in the Great Northern Brewery, Dundalk. The Earls of Roden had property interests in Dundalk for over three centuries, and at an auction in July 2006 the 10th Earl sold his freehold of the town, including ground rents, mineral rights, manorial rights, the reversion of leases and the freehold of highways, common land, and the fair green. Included in the sale were many documents, such as a large 18th century estate map. The buyer was undisclosed. 1318 – Battle of Dundalk (Battle of Faughart) fought on 14 October 1318 between a Hiberno-Norman force led by John de Bermingham, 1st Earl of Louth and Edmund Butler, Earl of Carrick and a Scots-Irish army commanded by Edward Bruce, brother of Robert Bruce, King of Scotland. 1941 – On 24 July the town was bombed by the Luftwaffe with no casualties. 1971 – The Battle of Courtbane – on Sunday 29 August 1971 a British army patrol consisting of two armoured Ferret Scout cars crossed the Irish border into Co. Louth near the village of Courtbane close to Dundalk. When attempting to retreat back angry locals blocked their way and set one of the vehicles on fire. While this was happening an IRA unit arrived on the scene and after an exchange of gunfire a British soldier was killed and another one was wounded. A bend between six martlets forms the coat of arms. The bend and martlets are derived from the family of Thomas de Furnivall who obtained a large part of the land and property of Dundalk and district in about 1309 by marriage to Joan de Verdon daughter of Theobald de Verdon (an Anglo-Norman family). Three of these martlets, in reversed tinctures, form the arms of Dundalk FC. The ermine boar supporter is derived from the arms of the Ó hAnluain (O'Hanlon) family, Kings of Airthir. 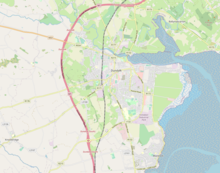 Situated where the Castletown River flows into Dundalk Bay, the town is close to the border with Northern Ireland (3.5 km direct point-to-point aerial transit path border to border) and equidistant from Dublin and Belfast. Similar to much of northwest Europe, Dundalk experiences a maritime climate, sheltered by the Cooley and Mourne Mountains to the North, and undulating hills to the West and South, the town experiences mild winters, cool summers, and a lack of temperature extremes. Places of interest in North Louth within 15 km of Dundalk. Dundalk has two photography clubs – Dundalk Photographic Society and the Tain Photographic Club. In 2010 Dundalk Photographic Society won the FIAP Photography Club World Cup. Dundalk has a vibrant music environment. The Fr. McNally Chamber Orchestra created in April 2010. It is a string chamber orchestra made of violins, violas, double basses and cellos and has 29 members. The Cross Border Orchestra of Ireland (CBOI) which is one of Ireland's primary youth orchestras. It is based in the Dundalk Institute of Technology and maintains a membership of 160 young musicians between the ages of 12 and 24 years. The CBOI was established in 1995 shortly after the implementation of the Peace Process and is recognised internationally and one of Ireland's flagship peace initiatives. The CBOI tours regularly to Europe and America and has sold out such prestigious venues as Carnegie Hall, New York and Chicago Symphony Hall. The Clermont Chorale. It was formed in 2003 and has 30 members, drawn from all parts of County Louth. Its repertoire includes music from the 17th to the 21st century, across many styles and genres. Dundalk School of Music. Created in February 2010, it aims to provide education in music for all age groups in many disciplines. Historic Dundalk Gaol is the home of The Oriel Centre – a regional centre for Comhaltas Ceoltoirí Éireann. The Oriel Centre Dundalk Gaol. opened in October 2010 and focuses on the promotion of Traditional Irish music, song dance and the Irish language. Shipping services to Liverpool were provided from 1837 by the Dundalk Steam Packet Company. Dundalk is an important stop along the Dublin–Belfast railway line, being the last station on the Republic side of the border. Its rail link to Dublin was inaugurated in 1849 and the line to Belfast was opened the following year. Further railway links opened to Derry by 1859 and Greenore in 1873. In the 20th century, Dundalk's secondary railway links were closed: first the line to Greenore in 1951 and then that to Derry in 1957. In 1966 Dundalk railway station was renamed Dundalk Clarke Station after the Irish republican activist Tom Clarke, though it is still usually just called Dundalk Station. The station is served by the Dublin-Belfast "Enterprise" express trains as well as local Commuter services to and from Dublin. It also houses a small museum of railway history. Dundalk's Bus Station is operated by Bus Éireann and located at Long Walk near the town centre. Major infrastructure upgrades have taken place in and around Dundalk. These improvements have covered the road, rail and telecommunication infrastructures for—according to the National Development Plan—a better integration with the neighbouring Dublin, Midlands Gateway, and Cavan/Monaghan Hubs. The M1 – N1/A1 connects Dundalk to Dublin and Newry. Works to extend it to Belfast were completed in July 2010. Dundalk Institute of Technology (often abbreviated to DkIT) is the primary higher education provider in the north east of the country. It was established in 1970 as the Regional Technical College, offering primarily technician and apprenticeship courses. The local newspapers are The Argus, Dundalk Democrat and Dundalk Leader. Online only media outlet includes Talk of the Town. The local radio station is Dundalk FM broadcasting on 97.7 FM, with regional stations LMFM (Louth-Meath FM) on 95.8 FM, and iRadio (NE and Midlands) on 105–107 FM also covering the area. Dundalk F.C. is a professional association football club based in Dundalk. The club currently play in the Premier Division of the League of Ireland. Founded in 1903, they are the second most successful team, in terms of trophies won (13 league titles & 11 FAI Cups), in the history of the League of Ireland. They play their home games in Oriel Park. Dundalk R.F.C. is one of the foremost junior rugby clubs in Leinster. Formed in 1877 Dundalk has a long and distinguished history having achieved many honours over the years. These achievements include winning the Provincial Towns Cup on 10 occasions from 15 appearances. Dundalk is currently in the Leinster League Division 1A and field three senior teams plus youth and mini teams at all age groups, and a number of girls' tag teams. Dundalk has seen the development of new sporting facilities including the JJB Soccer Dome and the Dundalk Ice Dome (both closed as of August 2012) where local ice hockey team the Dundalk Bulls (now defunct) played. The Ice Dome hosted the IIHF World Championship of Division III in April 2007. Both are held at Dundalk Stadium. August 2007 saw Ireland's first all-weather horse racing track open up on the site of the old Dundalk racecourse. The course held Ireland's first ever meeting under floodlights on 27 September 2007. Dundalk also held its first ever national fencing tournament in April 2007. Dundalk also has a basketball team, the Dundalk Ravens. Louth's only American Football team, the Louth Mavericks American Football Club (Formerly Dundalk Mavericks), are based in Dundalk and were set up in 2012. They play in the North division of the IAFL1 Conference in the Irish American Football League. They are coached by Head Coach Robert Shevlin, Defense Coach Adam Threlfall and Line Coach Jacopo Cecchini. The club chairman is Offensive Lineman Aidan Maguire. The club train at DKIT and play their matches at Dundalk Rugby Club. In 2016 the club went 5–3, finishing 2nd in the IAFL1 North division, and subsequently lost to the Belfast Trojans 2nds in the Semi-Final of the playoffs. 2017 was the most successful year in the club's brief history, they went 5–3 again, finishing 3rd in the IAFL 1 Conference. Dundalk also has a tennis club, The Dundalk Lawn Tennis and Badminton Club was founded in 1913 and held the Senior Interprovincial Championships (inter-pros) on 29–31 August 2010. Dundalk Cricket Club was founded in November 2009 and began playing matches in the 2010 season. It achieved the rare distinction of being recognised by the world leading cricket magazine The Wisden Cricketer as its "Club of the Month" for October 2010. This is both unusual for an Irish club and a club only twelve months into its existence. In 2011, the club was admitted into the Leinster Cricket Union and played in Leinster Senior League Division 11. In the 2011 season it won the Leinster League Division 11 Championship title and in the course of doing so became the only club in the whole of Leinster across the 14 divisions to go unbeaten. The club accumulated 277 points overall the highest points of any Leinster club in the 2011 season. In the 2012 season the club won their second title as Leinster League Division 9 Champions. Dundalk & District Snooker League has been running for over 20 years. In 2010 the league was re-branded as the Dundalk Snooker League sponsored, by Tool-Fix. The league has grown in popularity and has attracted national recognition through RIBSA (Republic of Ireland Snooker and Billiards Association) and the CYMS Letterkenny, who have arranged a "ryder cup" style challenge match against the best players in the Dundalk Snooker League. This season the league has 15 teams and 113 players competing in 6 championship events, 4 ranking events and 5 special events. The first cycling club in Dundalk was founded in 1874. Cuchulainn Cycling Club was formed in 1935 and is currently one of the biggest and most active cycling clubs in the country with over 300 members. The club caters for all disciplines of the sport including road, off-road and BMX. The club has acquired permission for the construction of a cycling park and 250m velodrome in Muirhevna Mor. Dundalk Kayak Club, founded in 2005, operates from their clubhouse just outside Dundalk town. They cater for all levels of kayaker and run beginner courses twice yearly. Dundalk Gaels GFC (founded 1928) and Seán O'Mahony's GFC (founded 1938) both represent the town. Louth County Council (Irish: Comhairle Contae Lú), County Hall, Millennium Centre, Dundalk is the authority responsible for local government in Dundalk. As a county council, it is governed by the Local Government Act 2001. The council is responsible for housing and community, roads and transportation, urban planning and development, amenity and culture, and environment. The council has 29 elected members, 13 of whom are from the Dundalk region. Elections are held every five years and are by single transferable vote. For the purpose of elections the town is divided into two local electoral areas: Dundalk-Carlingford (6 Seats) and Dundalk South (7 Seats). Dáil Éireann /dɔɪl ˈɛərən/ is the lower house, and principal chamber, of the Oireachtas (the Irish legislature; which also includes the President of Ireland, and the upper house or Seanad Éireann). Dundalk is represented in Dáil Éireann by the Louth parliamentary constituency. Fred Halliday, (1946–2010) writer and academic. Larry Goodman, entrepreneur in the beef industry. #22 on the Irish Independent Rich List 2017. Dr Pearse Lyons, entrepreneur; President of Kentucky-based Alltech Inc.; proposed the sister cities twinning with the City of Pikeville, Kentucky. #5 on the Irish Independent Rich List 2017. Henry McShane, established the McShane Bell Foundry; namesake of Dundalk, Maryland. Martin Naughton, entrepreneur founded GlenDimplex. #11 on the Irish Independent Rich List 2017. ^ "Dundalk - Carlingford and Mourne". ^ a b "Dundalk". 20 March 2009. ^ "Census 2011 – Population Classified by Area Table 6 – Population and area of each Province, County, City, urban area, rural area and Electoral Division, 2011 and 2006" (PDF). Census 2011, Volume 1 – Population Classified by Area. Central Statistics Office. 25 April 2012. p. 13. Retrieved 17 February 2014. ^ "Settlement Dundalk". Central Statistics Office. 2016. Retrieved 2 June 2018. ^ "Municipal District Dundalk". Central Statistics Office. 2016. Retrieved 22 December 2018. ^ Archiseek: The Architecture of Ireland. History of the Castle. ^ O'Sullivan, Harold (1 January 1977). "The Cromwellian and Restoration Settlements in the Civil Parish of Dundalk, 1649 to 1673". Journal of the County Louth Archaeological and Historical Society. 19 (1): 24–58. doi:10.2307/27729438. JSTOR 27729438. ^ NISRA – Northern Ireland Statistics and Research Agency (c) 2013 Archived 17 February 2012 at the Wayback Machine. Nisranew.nisra.gov.uk (27 September 2010). Retrieved on 23 July 2013. ^ Systems, Adlib Information. "Internet Server 3.1.1". www.louthcoco.ie. ^ Joseph Gavin and Harol O'Sullivan. Dundalk: A Military History. (Dundalk: Dundalgan Press Ltd., 1987), pp.109–137. ^ "Dundalk locals win the battle to keep the economy of the town they love so well alive". ^ Cowen, Brian (12 December 2000). Speaking in Dundalk at a public event with President Clinton (Speech). Dundalk, Ireland: Department of the Taoiseach. Retrieved 30 October 2018. ^ D'Alton, John (1864). The history of Dundalk and Its Environs: From the Earliest Historic Period to the present time. William Tempest. p. 8. ^ D'Alton, John (1864). The history of Dundalk and Its Environs: From the Earliest Historic Period to the present time. William Tempest. p. 10. ^ D'Alton, John (1845). The history of Ireland: from the earliest period to the year 1245, Vol II. Published by the author. p. 148. ^ Donnchadha, Pádraig Mac (8 June 2010). "History of Vikings in Ireland". ^ "The Munster Army at the Battle of Dundalk". www.libraryireland.com. ^ D'Alton, John (1864). The history of Dundalk and Its Environs: From the Earliest Historic Period to the present time. William Tempest. p. 12. ^ D'Alton, John (1845). The history of Ireland: from the earliest period to the year 1245, Vol II. Published by the author. p. 49. ^ "Battle of Dundalk, 14 October 1318". www.historyofwar.org. ^ D'Alton, John (1864). The history of Dundalk and Its Environs: From the Earliest Historic Period to the present time. William Tempest. p. 88. ^ D'Alton, John (1864). The history of Dundalk and Its Environs: From the Earliest Historic Period to the present time. William Tempest. p. 110. ^ D'Alton, John (1864). The history of Dundalk and Its Environs: From the Earliest Historic Period to the present time. William Tempest. p. 310. ^ D'Alton, John (1864). The history of Dundalk and Its Environs: From the Earliest Historic Period to the present time. William Tempest. p. 174. ^ "Battle of Courtbane attracts world media - Independent.ie". ^ "Dundalk bombing report, Ludlow murder expected in few weeks - Independent.ie". ^ "Home Page: The Dundalk Bombing, 19 December 1975". www.michael.donegan.care4free.net. ^ Flood, W. H. Grattan (29 March 1899). "The De Verdons of Louth". The Journal of the Royal Society of Antiquaries of Ireland. 9 (4): 417–419. JSTOR 25507007. ^ "Heraldry of the world - Category:Irish municipalities". www.ngw.nl. Archived from the original on 8 October 2017. Retrieved 18 February 2017. ^ a b c "Dundalk Migration, Ethnicity and Religion (CSO Area Code LT 10008)". Central Statistics Office. 2006. 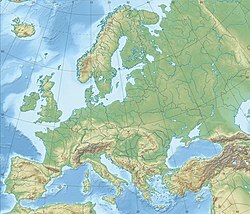 ^ "Dundalk Migration, Ethnicity and Religion (CSO Area Code LT 10008)". Central Statistics Office. 2011. Archived from the original on 29 October 2014. ^ "Dundalk Migration, Ethnicity, Religion and Foreign Languages". Central Statistics Office. 2017. ^ "Usually resident population by ethnic or cultural background". Central Statistics Office. 2017. ^ "Number of persons by religion (XLS 43KB), Row 147". Central Statistics Office. 2002. ^ "Population by religion". Central Statistics Office. 2017. ^ a b "HISTORY". www.stpatricksparishdundalk.org. ^ "About Us – St Joseph's Redemptorists Monastery". www.redemptoristsdundalk.ie. ^ Tibus, Website design and development by. "St Joseph's Redemptorist Church - Attractions - Churches, Abbeys and Monasteries - All Ireland - Republic of Ireland - Louth - Dundalk - Discover Ireland". www.discoverireland.ie. ^ "Robert Burns & the Louth connection". www.irishidentity.com. ^ a b "Home - Brigid of Faughart Festival - www.brigidoffaughart.ie". Brigid of Faughart. ^ Tibus, Website design and development by. "Saint Brigid's Shrine and Well Faughart - Attractions - Churches, Abbeys and Monasteries - All Ireland - Republic of Ireland - Louth - Dundalk - Discover Ireland". www.discoverireland.ie. ^ Tibus, Website design and development by. "Proleek Dolmen - Attractions - Museums and Attractions - All Ireland - Republic of Ireland - Louth - Dundalk - Discover Ireland". www.discoverireland.ie. ^ "Can Things Roll Uphill?". math.ucr.edu. ^ "Welcome to Dundalk Photographic Society". www.dundalkphoto.com. ^ "Fr. McNally Chamber Orchestra". www.facebook.com. ^ Home – Oriel Centre. Orielcentre.ie. Retrieved on 23 July 2013. ^ "Carlingford & Cooley Peninsula - Official Destination Website". Carlingford & Cooley Peninsula. ^ "Home - The Táin March Festival - Ireland's Ancient East". www.tainmarch.net. ^ "Annagassan Viking Festival 2013, Viking festival, Dublin festival, Louth festival, Viking re-enactments, Viking battles, Viking lifestyle, Home". www.annagassanvikingfestival.ie. Archived from the original on 14 December 2017. Retrieved 27 January 2019. ^ "Knockbridge Vintage Club – Our Club Website". www.knockbridgevintageclub.com. ^ "Programme for Ardee Baroque 2012 – Create Louth". www.createlouth.ie. ^ "O'Fiaich College, Secondary School". ^ User, Super. "Home". colaistecc.ie. ^ "O Fiaich Institute of Further Education Dundalk". www.ofi.ie. ^ "Talk of the Town - News from Dundalk and north Louth". Talk of the Town. ^ "Dundalk FM » Dundalk's Local Community Radio Station". Dundalk FM. ^ "Dundalk F.C." Retrieved 27 November 2013. ^ "Dundalk Rugby Football Club". Archived from the original on 2 December 2013. Retrieved 27 November 2013. ^ AG, Novanet Internet Consulting. "2007 IIHF World Championship Div III". www.iihf.com. ^ "Louth Mavericks AFC". www.facebook.com. ^ "Dundalk Lawn Tennis and Badminton Club". www.dundalkracketsclub.com. ^ Welcome to Dundalk Lawn Tennis and Badminton club. Dundalkracketsclub.com. Retrieved on 23 July 2013. ^ Dundalk Cricket Club home page Archived 9 October 2010 at the Wayback Machine. Dundalkcricketclub.com. Retrieved on 23 July 2013. ^ Dundalk Snooker League Archived 25 March 2012 at the Wayback Machine. Dundalk Snooker League. Retrieved on 23 July 2013. ^ "Cuchulainn Cycling Club - Catering for all Cyclists in Louth". www.dundalkcycling.com. ^ "Home - Louth County Council". www.louthcoco.ie. ^ "Services". Louth County Council. Retrieved 31 March 2011. ^ "2014 Local elections – Louth County Council". ElectionsIreland.org. Retrieved 5 June 2014. ^ "Dundalk agrees to twin with Pikeville, Kentucky - Independent.ie". ^ "St Gerard's Novena gets underway in Dundalk this Sunday - Talk of the Town". Talk of the Town. 7 October 2017. Retrieved 10 September 2018.